Kids discover the joy of being part of a team, while striving to reach their personal best. Swim Teams at the Y are designed for all levels of ability. They’re a great way for elementary-aged kids and teens to make friends, have fun, and enjoy a little bit of friendly competition. Our coach(es) know how to encourage fun while maximizing individual potential and promote swimming in the community. To provide quality instruction and development for each team member, swimmers are placed in practice groups based on ability, commitment level, age, and peer group. If your child is still getting comfortable in the water and unable to swim the length of the pool, we have progressive swim lessons to fit every child’s ability. Kids increase their strength and confidence in the water, physical fitness, and swimming ability while having fun with new friends. Swim Lessons run year-round. Parent/Swimmer Information Meeting – Thursday, September 6th or Monday, September 10th at 6:30 p.m. in the blue & white room overlooking the pool at the Y. Practices begin Monday, September 17th. Swim season runs through March 17th, and ending practice date will depend on your swimmer and their championship meet in which they qualify. Littles (beginners) and Middle Littles (advanced beginners): 6:00-7:00 p.m.
Middles (upper elementary & middle school) and Bigs (high school): 6:00-7:30 p.m.
Friday practices from 6:00-7:00 p.m. and extended practices times for the advanced groups will begin in November. Practice – bring suit, cap, goggles, and water bottle. Swimmers 11 & up also need a drag suit (drag suit for girls is any suit that is several sizes too big or an old suit that is baggy, and boys have specific drag suits that can be purchased or also any suit that is baggy or a non-swimmer summer swim suit to wear over their practice suit) and/or tights/hose for each practice starting the beginning of October. Meets- team suit & cap will be available to purchase starting at the Parent/Swimmer Information Meeting. The team suit & cap are required attire, as we do go to meets as a team. At the State Meet (and potentially the District Meet), swimmers 13 & older will be allowed to wear tech suits if they choose, but they are not mandatory. We have not enforced the team attire in the past, but are starting this year. As with any of our programming, if you need financial assistance in purchasing the team suit & cap (or team fees, etc. ), please talk with Coach Joyce. *Tie-back suits will not be allowed for practice or meets. Please see Coach Joyce for more information, if necessary for clarification. 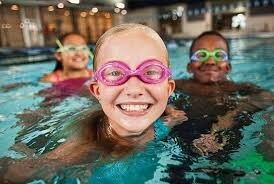 Note 1: All Swimmers during the winter season must be members of the Danville Family YMCA to swim during the winter season. Note 2: There are additional fees for invitational swim meets, to include personal travel expenses for the family. Meet fees are usually between $3-$5 per event. Note 3: Danville High School (DHS) swimmers must swim with the high school team to receive the high school discount. Note 4: Coach Joyce usually is on deck at the girls’ & boys’ high school sectional meet (and therefore the state meet as well, if someone qualifies). Any non-DHS swimmer interested in swimming should discuss competing at these meets ASAP so their school can register as having swimmers. I am currently taking swimmers from Salt Fork and Schlarman Academy. Registration is open in the computer system and must be completed prior to the first day your swimmer decides to practice. Registration packets with family information and health information forms will be available at the Welcome Center at the Y or at the Parent/Swimmer Information Meetings.